The U.S. Environmental Protection Agency announced this week that it has issued 36 grants totaling $2.57 million for projects to improve the health of the Long Island Sound. Fourteen of those projects, totaling $586,000, directly benefit New York State. EPA Regional Administrator Pete Lopez joinedCongressman Lee Zeldin, Judy Drabicki from the New York State Department of Environmental Conservation and Peter Francis from the Connecticut Department of Energy and Environmental Protection (DEEP) at the Port Jefferson Village Center Dec. 4 to highlight how the grants will benefit communities around the Long Island Sound watershed. The grants include money for water quality improvement projects that will treat 1.9 million gallons of water and collect 37,000 pounds of floating trash. The projects will open up six miles of river and restore 18 acres of coastal habitat for fish and wildlife. The grants will be matched by $3.09 million from the grantees, resulting in $5.67 million in funding for on-the-ground conservation projects in New York, Connecticut, Massachusetts and Vermont. In New York the $586,000 million in grant funds will be matched with $999,000 from the grantees. The New York projects include $67,542 for Group for the East End to conduct public and partner outreach, education programs and environmental stewardship activities, remove invasive plants, and develop habitat restoration plans for management of the 225 acre Hallock State Park Preserve in Northville. This project is matched by $101,371 from the grantee. 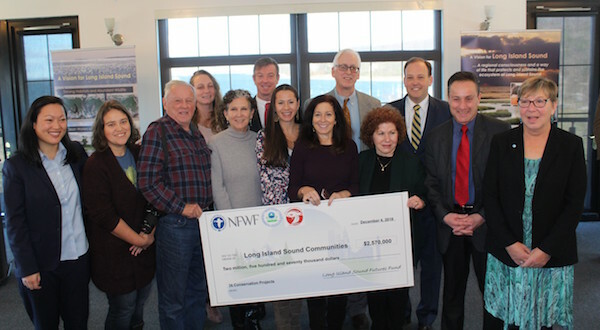 The Nature Conservancy of Connecticut will use a $44,986 grant to finalize the Long Island Sound Blue Plan to protect marine life in both Connecticut and New York. Audubon New York will use $41,009 in funding for its “Be A Good Egg III” program, which includes many shoreside areas including Stony Brook Harbor, Hallock State Park/Mattituck State Tidal Wetlands, and Plum and Gull Islands, New York. The program encourages people to share the shore with shorebirds, and engages the public in reducing threats to birds including piping plover, least tern, common tern, and American oystercatcher. Citizens Campaign Fund for the Environment will use a $45,000 grant for its “Going Strawless for Sea Turtles” public education progran to reduce the use of plastic polluting Long Island Sound beaches, bays, and harbors in Nassau and Suffolk Counties, New York. This project will gather 500 pledges from people to reduce common throw-away plastic use and engage ~200 volunteers in coastal cleanups. The Maritime Explorium in Port Jefferson will use a $43,626 grant to install native plant rain gardens, with 80 volunteers in high-visibility public sites and provide natural landscaping guidance to 400 community members in Port Jefferson. The project will demonstrate to 800,000+ visitors using the Bridgeport-Port Jefferson ferry how rain gardens improve the water quality and biodiversity of Long Island Sound. The American Littoral Society has received $10,000 to conduct the Long Island Sound Beach Cleanup along 191 miles of shoreline at 58 sites in the Long Island Sound watershed of New York. This project will engage 5,000 volunteers to collect 35,000 pounds of trash from shorelines, and to teach participants about preventing marine pollution into Long Island Sound. The Long Island Sound Study initiated the Long Island Sound Futures Fund in 2005 through EPA’s Long Island Sound Office and NFWF. To date, the LISFF has invested $19.6 million in 416 projects. With a grantee match of $36 million, the program generated $55.6 million for locally-based conservation. The projects have opened up 163 river miles for fish passage, restored 1,109 acres of critical fish and wildlife habitat and open space, treated 204 million gallons of pollution, and educated and engaged 4.7 million people.